Clash of Souls APK | Updated COC Private Server 2019. Clash of Souls Private Server for the Clash of Clans game dropped in our list of best servers, due to its stability and regular updated content. Like all most famous COC private servers we discussed on this platform. The ClashofSouls Apk 2019 also delivers it’s promise. The developers have loaded their servers with Unlimited Coins, Gems, Elixir and Dark Elixir. Just like other main Private Servers, this COS server also comes in different versions. Beside this the developer also provides private servers for the games like Clash Royale and Boom Beach. So if you are looking for a COC private server which has unlimited resources along with custom characters and buildings in the game. Then you are at the right place. I am going to make sure that this guide remain Simple and easy. What is Clash of Souls Private Server ? If you have visited our home page, you might know it well by now, That what is a COC private server and How it works. If you didn’t then pay a visit clashserver.info now. Well the clash of Soul is regarded as one of the oldest Clash of Clans Private Server. This is also known as the DarkSoul COC Server. The dedicated developers team has recently launched the Clash Royale Server too. Which is fun to play. The Clash of Soul Apk is released in 4 different formats, linking to 4 different servers. The custom build Towers have almost every troop special tower for the players. Like Healer Tower, Dragon, Minion, Witch, Lava, Lava Pup and Even Bowler Tower. The best advantage playing on this sever is that you don’t need Gems to upgrade your towers, Troops or buildings. All you need is 1 Coin and the moment you tap on upgrade, it’s instantly upgraded. So as a big Idle Clicker gamer, I have upgraded Buildings from Level 1 to Level 12 in 2-3 Seconds. That’s how fast I can tap the screen. And the good thing here is that the server responded to it without freezing or crashing like we saw in other private servers with custom buildings. (Clash of Magic). It not only supports Town Hall 12, but also as many Town Halls you want. The developers comes with their official site named ClashofSouls.cc. Which has all the details about the robust and stable servers structure to offer by the team. The Clash of Souls Server are amazing. The main features as the backbone of the COS servers. As mentioned earlier, The COS servers or the DarkSoul COC Private servers comes in a variety. To be exact there are 4 servers in working condition right now. Here are the details and download links to those servers. This server is specially designed for free souls. Who don’t want any rules or limits in their favorite COC game. The DarkSouls Server 1 is loaded with unlimited Elixir, Gems and Coins. While it also comes with the best modded characters from the other top supercell games. With custom Buildings and Troops, This server is highly recommended. The Server 2 or the Heart of Souls also comes with modded Buildings and Troops for COC. But this server has some limits enabled. So you can’t blindly buy anything from the shops. You have to startegise your gameplay accordingly and get the most needed upgrades. Beside this the Server also supports some common Commands. Download COS 2 from the link below. The Server 3 or the Velocity of Souls is closer to the real Clash of Clans game. All it delivers are the Infinite resources for your game. The Gems, Coins, Elixir and Dark Elixir are the only things you can get in this server. So it can be regarded as the Clash of Clans Mod Apk, with full resources bars. Download the Server 3 from the given link below. This specific server is hard to play. It has all the COC normal gameplay rules, without any unlimited resources. One has to work hard and research to grow in the game. But still you have more tons of Mods available. There are many Clash Royale and Boom Beach’s Characters and buildings added in this version of the server. You can download it from the given link below. If you are new with the Modded Apk or third party Android APK file installations read this. The good thing about these developers is that they have made Clash of Souls private servers for the iOS devices. 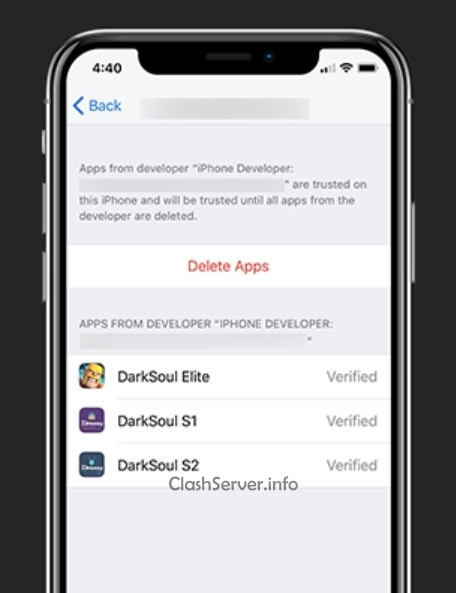 So you can easily download and install DarkSoul on your iPhone, iPad or iPod Touch without any Jailbreak. By simply using this guide and the download links. Step 1)- You can download the DarkSoul COC ipa file as Custom app. Step 2)- Make sure that you have installed iOS 7.0+ on your device. Step 3)- Now to inject the downloaded file into your device. Download the Cydia Impactor on your device. Step 4)- Connect your iPhone with PC and Open Cydia Impactor. Step 5)- Login with your Apple ID or create a new one. Step 6)- Now click on the downloaded app and inject it in your iPhone. I have spent hours playing this DarkSoul Private server. The coc game is best modified here. If you are looking for a simple COC mod apk, you can have it as Server 4. But if you want all the characters, troops and buildings of all Supercell games then you can download the server 1 and 2. Despite being heavily modified, The game is still stable. but sometimes you may experience some crashes while playing with too many modded chracters in the game. This may result into restart of the game too. Anyways we have way more COC private servers list for 2019 Check our homepage. 1 What is Clash of Souls Private Server ? 1.0.1 It not only supports Town Hall 12, but also as many Town Halls you want.